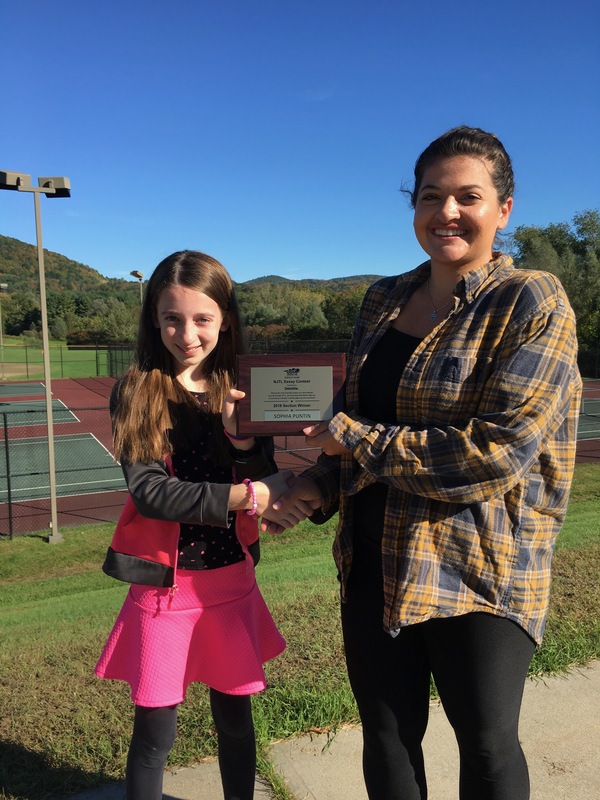 The Lee CTA is proud to be a National Junior Tennis & Learning (NJTL) Chapter! The NJTL ESSAY CONTEST (formerly know as "The Arthur ashe ESSAY CONTEST") is open to all children 6-18 years, who have participated in LEE CTA tennis programs. Enter and you could win a trip to New York City for Arthur Ashe Kids’ Day! PLEASE CONTACT BUNNIE WITH ANY QUESTIONS. "The most important lesson I have learned through NJTL is you have to be focused. As a tennis player you have to keep your eye on the ball, and you can't get distracted or else you will most likely lose the game. In tennis, you must stay focused if you want to do your best. And doing you best is just as important as staying focused. If you do your best, then you will probably do better than if you just swing your racket around and not try your best. In tennis, you also have to be respectful to the other players and you should always put effort into tennis." Click here to read the full essay. Congratulations Sophia!!! "I want to respect the world...I want to respect my friends...I want to respect the world, you see, so I can meet new friends...If I don't meet new friends, you see, I will be lonely...If I'm lonely, you see, how will I learn to play tennis?" Click here to read the full essay. Congratulations Sadie!!! "Tennis at first may seem like an individualized sport, and that every man is for himself. Especially by playing on a high school tennis team, I have realized that you all work together to win each point and each match and every player is crucial, even if you play the last spot on the team. From this, I have learned to face challenges by looking at them from multiple points of view instead of just mine and taking others into consideration before acting by myself." click here to read the full essay. Congratulations Suri !!! Arthur Ashe was an American hero fighting battles both on and off the court. He broke barriers in the tennis world, becoming the first African-American male to win a Grand Slam tournament and finishing his career with three Grand Slam titles, including the 1968 US Open. Off the court, he was a social activist taking on issues like racial prejudice, AIDS, apartheid and education. One of his many legacies includes National Junior Tennis and Learning (NJTL), a network of youth-serving organizations that provide tennis and education for all. His wish was for NJTL to be a resource for kids to develop skills for leadership and academic excellence. The Lee CTA has offered this contest to children throughout Berkshire County since 1999, the first year of the competition. That year, our own Laura Griffin was a National Winner in the 18U Girls division, winning the trip to NYC! In 2013, we were proud to have one New England Sectional winner, Hadley DeVarennes, Girls 10 and under. Local winners were Madeline Von Ruden, Girls 11/12; Ben Ames, Boys 10 and Under; CLICK HERE to read Hadley's winning essay! In 2002 New England Sectional winners were Mike Murch, 16; Kristen Berry, 12; and Laura Toomey, 10. Local winners were Andreas Naranjo (16U Boys), Amber Bitso (14U Girls), Peter Choi (12U Boys), Rebecca Strock (12U Girls), and Samantha Rydell (10U Girls). New England Sectional winners were Amber Bitso, Peter Choi, Rebecca Strock, and Samantha Rydell. Above are the 2002 Berkshire County & USTA/New England Winners with the local contest judges.